Nick, thanks for sharing. Your words always reach deep into the marrow of meaning and existence. Although at times difficult to understand our journeys, they are all we have…to appreciate, to love, and to remember. Please keep writing! It is so much who you are! Thank you, Mr. Volenik. I’ll do my best. I haven’t felt much like writing lately. Thanks for sharing. I lived in Texas for about 8 years–Corpus Christi. I did not see hillsides full of blue bonnets, but I did see some of the wildflowers every spring as I drove either up to San Antonio or Austin or all the way home to CA for a visit. The hills I pass these days have California poppies each year depending on the rain fall and some blue bonnets–sometimes even fields of them. I appreciate the memory–and have nostalgia for when the wild flowers were more prevalent everywhere, and children out on the hills was not such an unusual sighting. I will look forward to your blog entries whenever you can share them. Thanks, Patti. I do miss seeing more wildflowers. I think it’s been more than fifteen years since I last went to Corpus Christi. Hard to believe (for me, anyway)! What a beautiful picture and memory. I don’t think I’ve ever seen such a mass of flowers as that. It will be interesting to see where your journey leads. I think we always took the Blue Bonnets (and other native flowers) for granted when we lived in Austin. They don’t last long, and sometimes, if temperatures and rain aren’t just right, they barely bloom at all. Thank you! And you’re right. I’m quite lucky. Sorry to hear it didn’t work out for you…at this time. I know what it feels like to leave home, when I leave Texas. Thank you! You would definitely understand the difficulty of leaving Texas 🙂 Things are looking up though. Kentucky is a beautiful state. I’m also missing out on some of that summer “warmth” in Texas. Of course! Thank you Elizabeth 🙂 I hit a rough spot where I just didn’t feel like writing anything, but I think I’m back to it. Ahh, I’m erratic about these things. Right, as if that’s news. I was down in Austin in April, and even then it looked parched. Dallas lucked out. It got a fair amount of rain in the spring and the flowers drank it in. I remember driving through Circle C when it was a new neighborhood and most of the development was nothing but fields and oak trees. Everyone in my family used to lament that they mowed those fields, even when they were aflame with Indian Paintbrush and detracted in no way from the look of the neighborhood. Your photo of the sunflower stalk really captures the tragedy! Yes, it’s a great poem, and the line you quote is one of the best in it. Glad I could lead you to it. As for the mowers, I’ll keep mentioning their depredations in my blog from time to time, for whatever good that does. Your account of Circle C is all too typical. On the good side, I believe the Lady Bird Johnson Wildflower Center, being just across the way, has had a good influence. I think you’re right about the influence of the Wildflower center. I grew up near I-35 and Slaughter Ln. and attended Bowie HS. I just noticed that I slipped a ‘y’ in to “Bird” instead of an ‘i’! That’s kind of embarrassing. We’ll explain it away by saying that you were thinking about the “Y” in Oak Hill. Hah, that will work. I do know where the ‘y’ habit came from: I always think of former Senator Robert Byrd of West Virginia. Why? I have no idea. This brings back so many of my own memories! 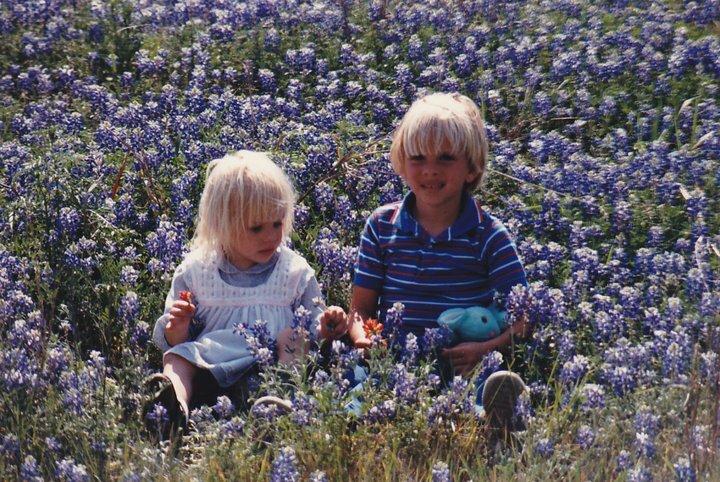 I have photos of myself as a child, and of my own children, sitting in fields of bluebonnets. Just remember: when one door closes, another one opens. Can’t wait to read about your new adventures, wherever life takes you.